Lindrick Kennels and Cattery is a family-run business with over 14 years’ experience in running a kennels and cattery ensuring we keep your pets happy, which is why we have so many repeat customers who we look forward to seeing year after year. We know many pets by name and often see the dogs pulling their owners into the kennels as they know what treats and fun they’re going to get. 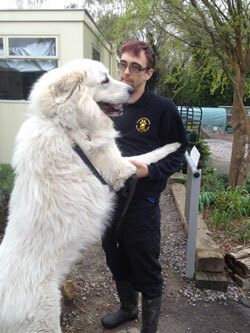 Lindrick Kennels and Cattery is a family run business with excellent co-workers. Richard Bromley who works Monday to Friday has been trained personally by us, so you can expect very high standards at all times. At weekends and busy times, we have other staff working. As we expect the same high standard of work, we often have young people who are going on to become vets, veterinary nurses and other caring professions. We feed your dogs and cats the same food as they eat at home, if possible, If that includes tea and toast in the morning or cereals, we're happy to arrange it. Sometimes they need to be encouraged to eat, but we do everything possible to make sure they do. Guidance as to amounts you feed your pets is helpful. We stock a large amount of different foods, but if your pet is on a specific food, bring it in and we will give it to them. We give medication as required (as long as they let us!) as part of our care. When you first come to us, we encourage dogs in particular to spend a couple of days with us prior to a long stay. This gets them used to us and to their surroundings and hopefully realise you will be coming back for them. Please come and look round our facilities. We do not make appointments. You can call in wherever you wish, within our opening times, and we will show you round. You will see where your pet will stay and can talk to us about individual requirements. Please bear in mind, particularly at busy times; we may be in the middle of cleaning. Our kennels and cattery are situated on the main A57 between South Anston and Worksop, 4.5 miles from Junction 31 on the M1. Our premises are surrounded by Lindrick Golf Course. The entry of our parking area is directly on the A57 and there is plenty of room to turn. Bath before collection on the day of collection. No changes to feeding, care, hugs or kisses as all the pets in our care receive this anyway. This service must be booked in advance and at time of booking to ensure the service will be available, prices are from £20 per dog per day. If booking using the online form just add 'priority book' to the 'additional details' section.